Manage your team’s performance and ROI more efficiently than ever. Assign and distribute leads automatically with round-robin to direct leads to the right agent. 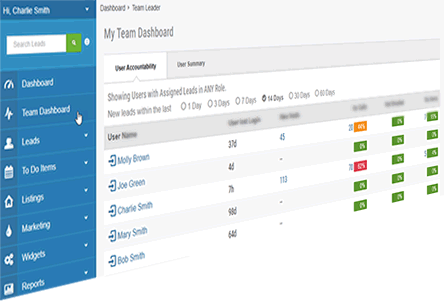 Team Dashboards help you easily keep track of your team members’ progress, performance and sales forecast. Establish team processes and workflow using combined action-plan drip campaigns for each of your agents. Get insights to team performance, activity and lead engagement with the Team dashboard. Get a complete demo and overview of the Ultimate IDX/CRM marketing system.